Didn’t win my first Cole Vintage Blog Giveaway? Then this giveaway is another chance for you! I’m giving away this versatile satchel perfect for students like myself! Click read more for simple mechanics on how to join! 1. Like One Day AND Cole Vintage on Facebook. 3. Follow me AND Cole Vintage on Twitter and tweet: “Want a Satchel from @colevintageph? Check out www.sophiemos.com! ” No need to tag me! Make sure to set your twitter accounts on public so that I can verify the tweet. +5, post this as your Facebook status: “Want a Satchel from @colevintage? Check out @One Day to win amazing prizes! 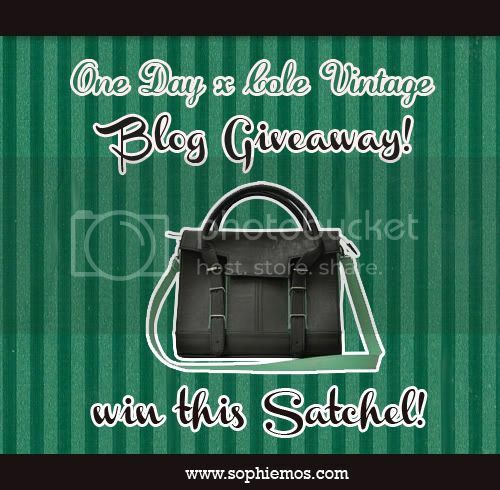 www.sophiemos.com” Make sure you tag One Day AND Cole Vintage. Also make sure your account is set on public, so that I can verify it.